SOCIAL MEDIA PORTFOLIO : With a background in producing, my favorite part of social media is brainstorming, creating, and executing large-scale marketing campaigns. My experience in social media marketing began as an rep for Rent the Runway in 2011. After a few years in film production, I took over social media marketing for my sustainable skateboard manufacturing company, Potaito Boards. Thanks to our strong brand presence on social media, our company has blossomed into a reputable brand within the industry, both on and offline. Potaito Boards was a small brand - which meant an amazing(!) open slate for original content creation - but this small nature also came with a lack of brand awareness. I focused our strategy on partnerships with brands and influencers with strong engagement and similar core values. This would ensure that our media targets the correct demographic. Lastly, I retained our current followers by consistently producing a steady flow of unique and relevant content. In addition to managing our content calendar, social media outlets (Facebook, Instagram, Twitter, Pinterest), and blog, I tracked our progress with data and analytics, constantly adjusting our strategy to meet our KPIs. When I started Potaito Boards, I knew my marketing strategy had to veer as far from traditional skate media as possible. Traditional ads were old-fashioned, exclusive, and boring -- I knew we could do better. We dedicated ourselves to pushing women skaters to the forefront of our social media campaigns. Not only did these campaigns do exceptionally well, I was able to meet countless communities of women skaters in the US which was an amazing experience for our team! We partnered with New York-based photographer, Nico Guilis of Find Your California for a feature in Harper's Bazaar based on surf and skate culture in Montauk, NY. This feature secured our brand's reputation in the luxury and design space, particularly within the fashion crowd. 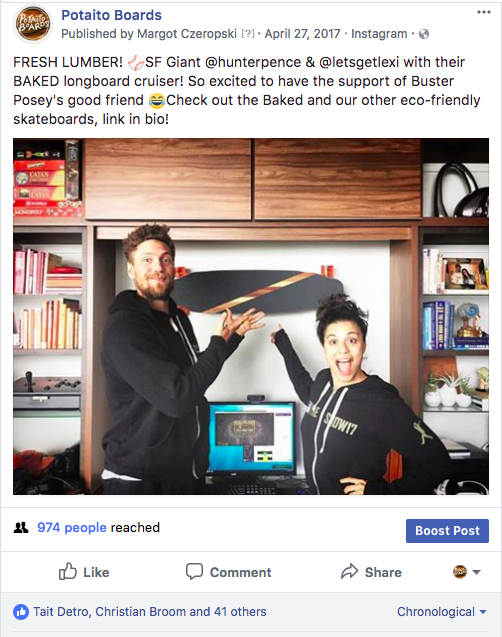 We were selling most of our skateboards to Santa Cruz, CA locals and fans so I proposed a social media collaboration with Verve Coffee, a beloved Santa Cruz based company. The SC community took notice - not only did this post gain us new followers online and gain 1.1k likes, we were also featured in several local newspapers and invited to sell in pop up shops around the county. In 2016, everyone in the SF Bay Area was talking about Hunter Pence. He was the star of SF's most widely-watched sports team, the Giants. We reached out to him via social media and he agreed to do a shout out for our brand, based on our media's positive message and environmental guidelines. Keeping with our female-centric media promise, we collaborated with famed surf photographer Sarah Lee (National Geographic, CNN) on a product shoot for our new longboard launch. She shot amazing original content for our website and social media and featured many of them on her own 200k+ followers. Her multiple posts with us gained over 2k likes. Speaking of features: by establishing a strong brand presence online through our social media outlets, publications were more willing to reach out to us. Most writers and journalists commented that they could easily understand our brand story from our posts -- attracting them to a potential feature. We had many editors reach out to us this way. A big challenge for Potaito Boards was creating a brand's social media outlets that represent a company, but don't scream "corporate." I curated and edited a strong lineup of both original and user-generated content that was unique to our brand but also interesting for our users... beyond the product we were selling. This explains our high user engagement and retainment. Seasonal online campaigns, hyper-lapse videos, slow motion videos, product review videos, and Boomerangs and GIFs. Blog posts promoted on social media outlets are a great way to display new content and also improve a website's SEO by driving users directly to the site. I love social media strategy and producing original content. Social media's capacity for bringing together communities, motivating others, and encouraging collaborations make this field exciting to me.